Who gets the home inspection report/information? If the report is good, did I really need an inspection? A home purchase, especially in today's market, is a large investment. You should know exactly what to expect with regard to repair and maintenance. The home inspector presents a professional opinion as to the condition of the property before you buy. A home inspection will also point out the positive aspects of a home and the type of maintenance that will be necessary to keep it in good shape. After the inspection, you will have a much clearer understanding of what it is you are about to purchase and you will be able to make your decision confidently. If you have owned your home for a period of time, a home inspection can identify problems in the making and recommend preventive measures, which might avoid future repairs. If you are preparing to sell your home, an inspection can point out areas that may be of concern to prospective buyers. A complete home inspection includes a visual examination of the house from top to bottom. The inspector assesses the heating and cooling systems, the interior plumbing and electrical systems, the roof and visible insulation, walls, ceilings, floors, windows and doors, the foundation, basement and visible structure. Our consultation is dedicated solely to you, our customer. We do not discuss the report with anyone else without your permission. We do not sell or share the report with anyone else. Your report will be available online for you if you wish to share it with your Realtor, family and others who may not have access to your printed report. Online reports are password protected for confidentiality. The presence of the owner, seller or real estate agent at the inspection can be helpful in some cases and will not detract from your inspection or distract our inspector. Our inspection presentation is always focused on you. A professional home inspector is familiar with all the elements of home construction and with the proper installation, maintenance and interrelationships of those elements. Components are inspected systematically to ensure that all items are included. Additionally, even very experienced and knowledgeable buyers find it difficult to remain completely objective about the house they really want, and this may lead to a poor assessment. If the inspector finds fault in a home it doesn't mean that you shouldn't buy it, only that you will know in advance what type of repairs to anticipate. 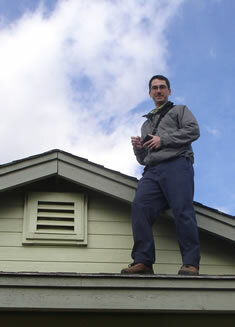 A professional home inspection is an examination into the current condition of your prospective home. A home inspector will describe the home's condition and indicate which items will be in need of immediate or near future major repair or replacement. Definitely. Now you can complete your home purchase with peace of mind about the condition of the property, its equipment and systems. You may also have learned a few things about your new home from the inspector's report, and will want to keep that information for future reference. Most importantly, you can feel assured that you are making a well-informed purchase decision and that you will be able to enjoy your new home the way you want to. 4Site Home Inspection of Flagstaff AZ - Flagstaff home inspector -ASHI standards for Sedona Prescott Verde Valley etc..
4Site Home Inspection of Flagstaff AZ, Sedona, Prescott, Verde Valley offers home inspector, to ASHI standards for Williams AZ, Winslow, Holbrook, Chino, Ash Fork, Seligman, Cottonwood, Munds Park, Pinewood, Kachina Village, Parks, Bellemont. home inspector, house inspection, pre sale, real estate inspection, new construction, home warranty inspection, 1 year warranty, listing inspection, commercial, residential, final, property, roofing, building, insurance inspections, builders warranty, checklist, service, FHA, HUD compliant foundation engineering certification, new home, insulation leaks, moisture, air quality test, toxic mold test, black mold, detection, ASHI, professional, RADON, certified home inspections, commercial inspections, pre marketing inspections, buyer inspections, termite inspections, electrical, gas, plumbing, roofing inspections.